The San Francisco Unified School District is trying to hire teachers that reflect its student body. At a recruitment event on Wednesday, Feb. 4, prospective African-American teachers and support staff will have the chance to meet principals, submit resumes and get a sense of what working for the district might be like. "It's an opportunity for African-Americans in the community who want to work with our students to get a one-on-one opportunity to engage with the district, with our administrators and with our human resources staff," said Swen Ervin, a human capital specialist at the district with an emphasis on diversity. Ervin's job is to reach out to organizations, schools of education and community members to attract more qualified candidates of color to the district. 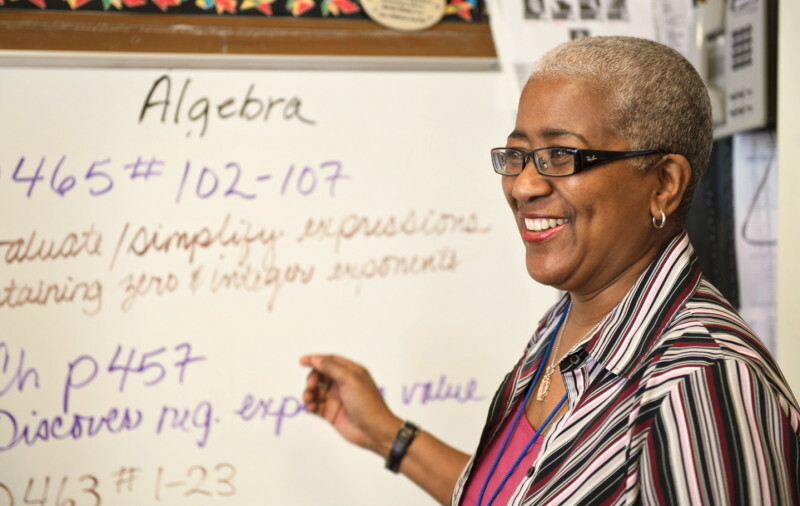 The focus is working -- three years ago the district hired 17 African-American teachers. That number increased to 23 two years ago and peaked at 39 last year. But that doesn't mean those teachers always stay. Ervin says African-American teachers have the lowest retention rate of any demographic in the district. "A lot of teachers of color experience very high rates of burnout," Ervin said. "A lot of times when they work in diverse schools, whenever something is going on with the students of the community they represent, they are kind of deferred to or burdened with whatever those issues are." Teachers of color can also feel isolated in their school buildings, unheard as a minority group, Ervin added. His goal is to not only hire more African-American teachers, but to check in on them and make sure they have what they need to be successful. He'd like African-American teachers working across the district to be able to rely on one another for support, but has found it hard to convene meetups because teachers' schedules are already stretched so thin. Public schools in San Francisco overwhelmingly serve students of color, and the district is aiming to have its teaching staff mirror those demographics. Right now, about 8 percent of students are African-American, but only about 5.5 percent of their teachers are African-American. "It's hugely impactful to see someone that looks like you on a daily basis," said Landon Dickey, the district's new special assistant for African-American achievement and leadership. "That person can serve as a role model for students. And it shapes their perception of whether or not they can be successful, based on how many African-American adults that are in positions to help shape their own lives." Dickey attended Lakeshore Elementary, then A.P. Giannini Middle School and finally Lowell High School in San Francisco. He can pinpoint several points in his own education when a dedicated teacher helped him through an academic struggle or helped him stay motivated. In kindergarten and first grade, Dickey says, he was a problem child, acting out and getting held after class. "I had a speech coach in the first grade that helped me work through a stutter that often times left me in tears," Dickey said, "that was there as my support to coach me through that challenge that I had, and ultimately got me a lot more excited in school." He also credits his eighth-grade teacher for helping him love writing and a high school geometry teacher for taking a special interest in him when he was on the edge of failing. These personal experiences shape Dickey's hope that in his tenure at SFUSD he will be able to help all African-American students find a mentor. "If nothing else, if you have a person who's there for you consistently that can help you understand how to navigate the school system, that can help you shape your goals, that can help you when you're down -- if you can have that person, that goes a long way in keeping up your engagement and excitement about going to school," Dickey said. He will also be working to carry out three recommendations made by a team that SFUSD Superintendent Richard Carranza convened to look at African-American achievement in 2013. Dickey plans to focus on building up trust and engagement among the African-American community, rooting out racial bias in the classroom, and trying to build on success stories happening in pockets across the district. He's only in his second week, so right now he's trying to meet lots of community members, visit schools and learn from parents and students. The recruitment event will be held at the African American Art & Culture Complex at 762 Fulton St. and runs from 6 to 8 p.m.